Celebrity favourite charter yachtAxioma will be available to charter in Cuba for the first time next year. The 72.5 metre yacht will be visiting the Caribbean island next February and March and can be chartered exclusively through Yachting Partners International (YPI). The announcement comes following a thawing of relations between America and Cuba, which has seen a huge increase in visitors to the country. The recent policy changes are expected to boost Cuba's superyacht charter industry and Axioma is arguably the most famous charter yacht to visit the country. Despite its growing popularity Cuba still has limited infrastructure for superyachts but guests on board will be expertly guided by YPI and the yacht's experienced crew. Delivered by Dunya in 2013 Axioma can accommodate 12 guests in six cabins. She is famous for having the “wow factor” and her standout features include a huge atrium and one of the best superyacht swimming pools. Her stylish design features are just one reason why celebrities love to charter Axioma. Last year Kendall Jenner, Gigi and Bella Hadid were all spotted holidaying on Axioma. “Cuba in itself is an amazing destination to visit and soak up, but Cuba as enjoyed and experienced from the on board luxury and calm of Axioma has to be the ultimate private, quality escape for any discerning guest with their family or friends. One they will never forget,” added Duncan. 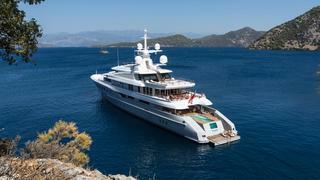 Axioma will be available to charter in Cuba with YPI from €550,000 per week.